McElroy, a native of Arlington, Wash., will perform his senior piano recital free to the public at 4:10 p.m. Friday, Nov. 8, in Kimbrough Concert Hall at WSU Pullman. Selections will include Ginastera’s “Sonata No. 1,” Ravel’s “Valses Nobles et Sentimentales,” Beethoven’s “Sonata No. 26 (Les Adieux)” in E flat major, and Bach’s “Prelude and Fugue” in G major. McElroy is a WSU Regents scholar, member of the Honors College (http://honors.wsu.edu) and recipient of the 2013 Presser Award, the School of Music’s (http://libarts.wsu.edu/music/) most prestigious scholarship, among other awards and scholarships. Eric McElroy plays piano in the ballroom of the 18th century Palais Corbelli in Vienna. McElroy was honored last spring with a scholarship to study at one of the most renowned music conservatories in Vienna, Austria, the world capital of classical music. As McElroy readies himself for graduation in December, he’s also preparing to audition for master’s degree programs at three major conservatories in Vienna. 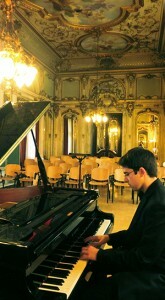 A pianist since the age of three, McElroy began composing in the second grade. At age 15, he won his first concerto contest with the Everett Symphony Orchestra performing Francis Poulenc’s piano concerto. He was a national finalist for the Music Teachers National Association composition competition in 2008 and won the National Association for Music Education’s national composition contest at age 16. McElroy recently sat down for the first time at the new Steinway grand piano in Bryan Hall auditorium at WSU Pullman. The elegant black instrument was brought to the hall last spring while he was in Vienna. “I’ve heard it’s pretty mellow,” he said, embarking on a colorful melody. Suddenly, he gave the keys two solid attacks. “It’s got a little bite,” he noted with appreciation and resumed yet another exceptional performance.